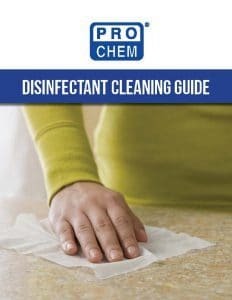 Power Pouch Disinfectant | Pro Chem, Inc.
POWER POUCH DISINFECTANT is a concentrated, multipurpose, hospital-grade, quaternary, germicidal detergent and deodorant effective in hard waters up to 400 ppm (calculated as CaCO3) plus 5% serum contamination. This product is also a mildewstatic disinfectant for destroying and inhibiting mildew growth. It can be used on all washable, hard, nonporous surfaces including floors, walls, metal surfaces, stainless-steel, porcelain and plastic surfaces. 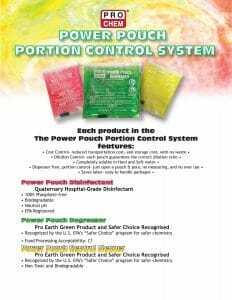 Easy to distribute, this handy portion control packet provides accurate results as no measuring is necessary, eliminating over use. PREPARATION OF USE SOLUTION: For water hardness up to 400 ppm add 1/2 ounce per gallon of water (1:256) (850 ppm active quat) (or equivalent use dilution) to disinfect hard, nonporous surfaces. Treated surfaces must remain wet for 10 minutes. Apply use solution to hard, inanimate, nonporous surfaces, thoroughly wetting surfaces with a cloth, mop, sponge or sprayer. For heavily soiled areas, a preliminary cleaning is required. For sprayer applications, use a coarse spray device. Spray 6-8 inches from surface. Rub with brush, sponge or cloth. Do not breathe spray. 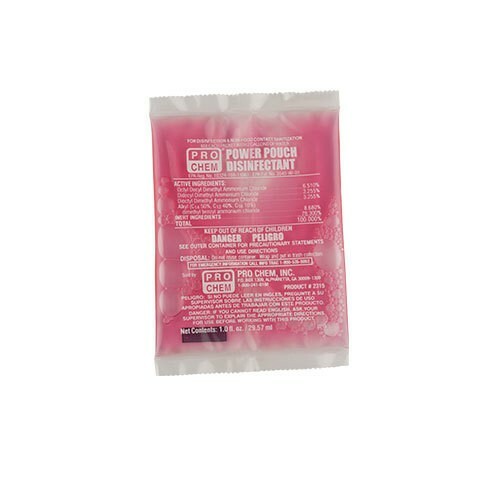 Before using this product, food products and packaging materials must be removed from the room or carefully protected. After use, all surfaces in the area must be thoroughly rinsed with potable water. Mix one pack with 2 gallons of cold water.